Thermal heat transfer is the physical act of thermal energy being exchanged between two systems by dissipating heat. Temperature and the flow of heat are the basic principles of heat transfer. The amount of thermal energy available is determined by the temperature, and the heat flow represents movement of thermal energy. 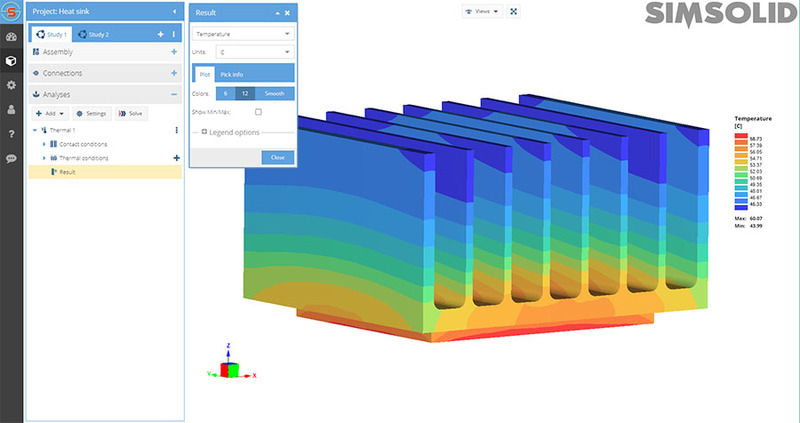 Thermal analysis has always been available in our Altair SimSolid desktop versions but now it has been added to Altair SimSolid Cloud as well. Read on to find out more. Heat transfer occurs by three different mechanisms: conduction, convection and radiation. Conduction transfers heat via direct molecular collision. An area with greater kinetic energy will transfer thermal energy to an area with lower kinetic energy. Higher-speed particles will collide with slower speed particles. The slower-speed particles will increase in kinetic energy as a result. Conduction is the most common form of heat transfer and occurs via physical contact. Examples would be to place your hand against a window or place metal into an open flame. When a fluid, such as air or a liquid, is heated and then travels away from the source, it carries the thermal energy along. This type of heat transfer is called convection. The fluid above a hot surface expands, becomes less dense, and rises. At the molecular level, the molecules expand upon introduction of thermal energy. As temperature of the given fluid mass increases, the volume of the fluid must increase by same factor. This effect on the fluid causes displacement. As the immediate hot air rises, it pushes denser, colder air down. This series of events represents how convection currents are formed. Thermal radiation generates from the emission of electromagnetic waves. These waves carry the energy away from the emitting object. Radiation occurs through a vacuum or any transparent medium (either solid or fluid). Thermal radiation is the direct result of random movements of atoms and molecules in matter. Movement of the charged protons and electrons results in the emission of electromagnetic radiation. In addition, thermal heat transfer can be thought of as either steady state (constant in time) or transient (varies with time). In Altair SimSolid, thermal analysis is steady state and simulates conduction and convection effects only. Radiation and transient thermal analysis are not supported at this time. 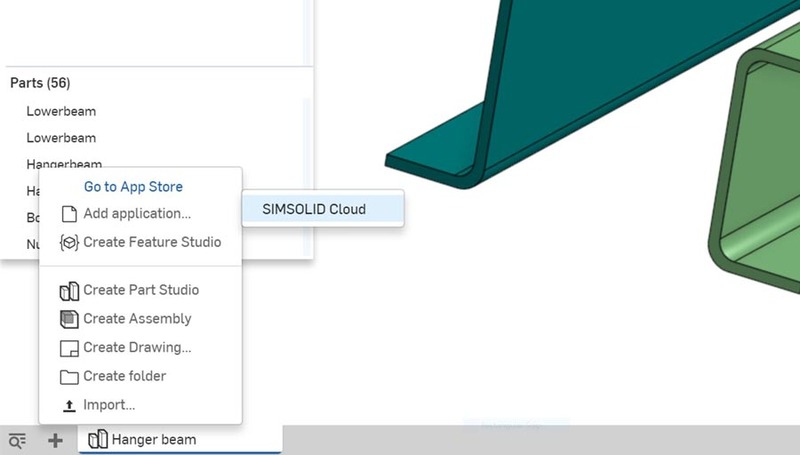 Altair SimSolid Cloud is available directly in the Onshape cloud based CAD system. 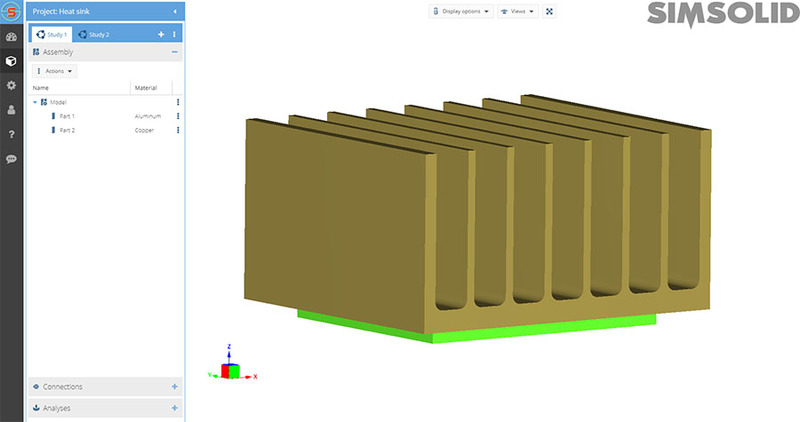 To do a thermal analysis, first open Onshape and add a Altair SimSolid document tab to launch Altair SimSolid Cloud. Next, add your geometry, material properties and part connections. The method to do this is identical to what is done for structural or modal analysis. 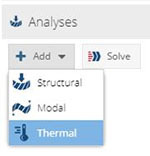 Now, to create a thermal analysis, go to the analysis pane and select the Add analysis menu. Then, create appropriate thermal boundary conditions. Possible conditions include prescribed temperature, heat flux, volumetric heat or convection. All boundary conditions are selected by either the action menu or using the right mouse button selection directly in the project tree. Optionally, thermal specific contact conditions can be applied between parts in the assembly. Two values are possible: no thermal resistance or insulated. No thermal resistance is the default condition and means that full heat transfer will occur through the part connection. Insulated means the opposite. No heat transfer will occur. Finally, just select analyze. In Altair SimSolid, geometry simplification and meshing are not required. This dramatically simplifies the analysis workflow. Once the analysis is complete, results will be automatically displayed . Altair SimSolid thermal analysis will determines the temperature, thermal flux and temperature gradients at every location of the model. Altair SimSolid Cloud is available from the Onshape App Store. A free trial is available. Anyone using Onshape is invited to try it out.